Before you decide to move to Canada or sell all your stocks or bury your money in the backyard, take a deep breath. There are two more months to go before our new president takes office. Laws haven't changed yet, policies have not been repealed, and we still have the holidays to go through. Markets hate uncertainty, so don't be surprised if the next administration has some familiar names or faces from previous presidential teams. After all, the president's assets go into a blind trust during his or her administrative years, so every effort will be made to make sure how ever those assets are invested they will grow over those years, which is hopefully how our 401(K) plans will be growing too. For those of you who may be very disappointed in how the election turned out, this is your cue to become more involved in the political system. Politics is local, goes the saying, so maybe working with local city council representatives, state representatives, and even working on educating your neighbors on issues that matter to you may make a difference the next time around. If this has clarified for you issues that matter, then get involved with organizations that work to overcome prejudice, bigotry, sexual assault and harrassment, bullying and disrespect of the disabled, as well. We all need to open our minds and our hearts to make this nation the best it can be. After all, democracy is not easy, it takes hard work, involvement, and respect for one another. With all the hacks going on it is time for you to RESET your passwords. Make at least one character in your password be a NUMBER. Also be sure to use at least one UPPER-CASE LETTER, as well as at least one LOWER-CASE LETTER. Sprinkle in at least one SYMBOL: these can be found by shifting your number keys on your keyboard, or by pressing the special character selector on your tablet or phone. You can combine words from your favorite songs, initials that have meaning for you, with dates or numbers you can remember. For each account you maintain use a different password. Why? Because if hackers figure out one, they may use it across the board, and access all your accounts. Yes, this is a lot of work, but consider it a recipe for success and privacy. Change your passwords regularly, like at least once a year. And remember to use double verification systems that notify you by alternative means that your account is being accessed. Giving is what the holiday season is really all about. So when you are making your seasonal budget for gifts, include the charities in your community, charities that appeal to your interests and make a difference in the everyday life of the place where you live. Most charities are classified by the IRS as 501(c)(3) organizations, and as a result, gifts made to them are eligible for a tax deduction. Always check with your tax advisor to learn to what extent you can use the deduction for the current tax year. Follow your passion: helping the homeless, sharing with returning soldiers, feeding the hungry, supporting the visual arts, giving to your alma mater, whatever you care about, that is what will make the difference for you and for your city or town. Once you've figured out your passion investigate before you give. Look at www.guidestar.org or www.charitynavigator.org to learn more about the groups you think you want to support. As a rule of thumb, when looking at expenses, if 75% or more is spent on programs that is a positive, and 15% spent on administration and 10% on fundraising, you'll be looking at a well managed organization that is making a difference. Watch out for unsolicited phone calls, emails, or letters. These may be phishing expeditions that could lead to identity theft. Investigate, make your decision, and then make your gift. If you really love supporting the groups that speak to your heart and your mind, then become an annual donor, attend events, and be an ambassador for the organization and its good works. Make applying for college easy and fun. My friend, Janine, shared with me her College Application Checklist worksheet and her College Financial Aid Checklist worksheet. 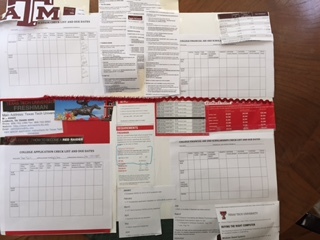 Each sheet is designed to help you get the paperwork together in a timely fashion that is needed when you apply to the schools of your choice. For her daughter she made a poster that features the school colors, motto and mascot, as well as the pertinent information needed during the application process which starts August 1st for matriculation Fall of 2016. A photo of one of her posters is shown below. The College Application Checklist worksheet has spaces for you to list the dates due, and the dates sent for everything from the application itself to transcripts to letters of recommendation and more. THe College Financial Aid Checklist worksheet is helpful for organizing your FAFSA materials as well as any other grant or scholarship applications you may be completing as you look for money for college. In addition, there are two other worksheets. The College Selection Worksheet, which you can use to figure out what features are most important to you in selecting the colleges to apply to or attend and the College Expenses Worksheet, which helps you figure out what it will really cost you to attend the schools of your choice. All of these worksheets are available free on the MoneySmarts4U website by clicking here and completing the form required. With summer just around the corner, a lot of love is in the air. Whether you want to marry or not, you may find that at some point you will be moving in together with someone, whether they are your lover, best friend, life-long companion or pal. Here are the 7 things you need to do before you move in together to take care of yourself and each other. 1. Execute a written agreement that says what belongs to whom. This can be a simple list of what you each bring into the house, apartment or relationship. Include everything from dishes to investment accounts to debts. 2. Execute a written agreement that says who pays for what. Not only does this make things go more smoothly but it allows for each of you to plan your financial obligations. Will you divide expenses or will you take turns paying for things? Negotiate and figure this out ahead of time to save arguments and hurt feelings later. 3. Execute a written agreement about what happens if you separate, break up or go your separate ways. If you've done the first two things on the list, this is pretty simple. Everyone takes their toys and goes home. But if you have commingled everything, then without this agreement you may have a mess on your hands. 4. Make a list delegating household responsibilities to each partner or party residing in your household. Job jar or to-do list: it's up to you! 5. If you are in a loving relationship, then execute your wills, directives to physician, durable powers of attorney for health care and managing your assets, with your lover as your beneficiary and your representative. 6. Update your HIPA documents with your doctors and health care providers to include your partner or lover. 7. If you have children together, then make sure you have guardian language included in your wills and other life-planning documents. Keep your family and close friends informed about your life decisions as you age and your relationship seasons. If your friends are your family, make sure they are part of your circle as your life progresses. Create that support group that can be there for you and for your partner and your children all life long. One: Know what is the most important thing you want to remember about your wedding. Considering that the wedding ceremony itself lasts about thirty minutes, at the most an hour, and that most receptions last from three to five hours, the entire event encompasses approximately six hours at the most. You will be so busy socializing that it may be one big blur when you take time to recall it. Of those six hours, what do you most want to remember? The father of a recent bride told me that the most successful weddings have loving family and friends in attendance, good food, good drink, and good music. Everything else really doesn’t matter. Invite the people who matter to you, serve food and beverages you like, and listen to music that makes you happy. Be careful about spending more than you can afford. Going into debt in order to pay for an event that lasts less than a day may not be in your best interests. Work out a wedding plan that respects a budget and gives you what your heart desires. Before you set your heart on your perfect wedding, think about these numbers. A destination wedding can cost upward of $60,000. Entertaining three hundred of your closest friends with a band, dinner, and open bar will run at least $100,000. Sharing your joy with immediate family and friends with wedding cake and domestic champagne and a four-piece band may run around $10,000 or more. If you imagined the type of wedding featured in the magazines and on television, now you may want to think about having a small wedding and spending your money on a great honeymoon instead. Three: What wedding planners do and will you need one? Will you need a wedding planner? A professional can help you from the date you are engaged through the stroke of midnight the day you are married. If you don’t need that much help, then hire a planner just for the day of the wedding to take care of the details that you don’t have time to attend to on your special day. If you can’t afford a planner, then perhaps a trusted friend will agree to handle the details on the day of the ceremony and receptions. Find a wedding planner who understands the concept of a budget and staying within that budget. Some wedding planners both charge you a fee and receive commissions from the various vendors recommended to you. Inquire about how the planners you are interviewing are paid, read their contract, and verify their references. Having a wedding planner can take the stress off of you and your family members the day of the event, leaving you to focus on getting dressed, being with your loved ones, and looking radiant or handsome the day of your ceremony and celebration. You want someone who is organized, reliable, and who is capable of making good decisions quickly in the event something changes in the last few days leading up to your special day. Decide what you want to spend on your wedding, and then create your spending plan, including only the items you need. Take pleasure in creating a beautiful day with elegance and style while spending within your means. Download the MoneySmarts4U Wedding Budget Worksheet by clicking here. Once the music stops, the cake is gone, the champagne bottles are empty, and your friends and family have returned home, you and your betrothed will be married. Together you will face the world and all its challenges. Don’t be surprised if you feel a little emotional letdown after all the planning and excitement of executing your wedding. Your honeymoon is the opportunity for you and your mate to take a vacation to recover from your wedding and settle into life together. Hopefully you’ve been as careful in developing the spending plan for your honeymoon trip as for your wedding. Setting money aside for a destination that fits your overall spending plan will make your return to married life together more pleasant. Two of my favorites at this time of year, It’s a Wonderful Life and It Happened on Fifth Avenue, both have money and love messages. Both of these are black and white films, made in the 40s, with heartwarming messages and business tips that speak to me today. As the last line of It’s a Wonderful Life states, George Bailey, the savings and loan owner, who has no money, but who is rich with friends, is the richest man in town. When the angel, Clarence, shows him how much of a difference he made in the lives of the people in the town, the difference he made by truly helping people, not just entertaining them, but truly helping them, he realizes how wonderful his life is, and then so do his friends, helping him out of a jam, when he needed it most. It Happened on Fifth Avenue juxtaposes the life of a homeless man with extravagant taste and impeccable manners, with that of the wealthy industrialist in whose home he is living. The generosity of one is compared with the avariciousness of the other, while one is held in esteem for his generous nature and willingness to problem solve and help others the other alienates his family and potential friends. When the industrialist changes his nature and helps the struggling World War II vets with their business deal, he learns that a man with friends is indeed wealthier than one with all the money in the world. Enjoy both of these holiday classics and have a very Happy Holiday Season! Now is the time of year to consider gifts to non-profit organizations if you want the benefit of the tax deduction for the 2014 tax year. The last day to give is December 31st. Consider the local food pantry, homeless shelter, religious institution, animal shelters and others. If you have a passion and a cause, then you may want to search for the perfect charity for you. Check out www.charitynavigator.org and www.guidestar.org to get more information about the not-for-profits that might be of interest for you. Consider if the organization is growing and serving more people, reaching its goals, and making a difference in the community. When looking at the financial side of things, use the following guidelines to evaluate how the organization is managed: 75% spent on programs or the mission of the organization, 15% on administration and 10% on fundraising. Groups much outside these guidelines may not be making the best use of your funds, so ask questions, look at their website, or make a site visit to see how they work. Beware of responding to a sob story from a telephone solicitor, since you really don't know who they are. Do not give out your credit card information, address, or any other private information over the phone. Phishing emails asking for funds are also circulating at this time of year, hoping to pull at your heart strings, so resist the temptation to give your information to a stranger. Enjoy the season! Find the charity that interests you and fills your heart with joy! Give to help others and your community. God Bless You All! 1. Safeguard your photo id, passport, social security cards and financial documents. 2. Burn or use a cross-cut shredder to destroy documents that have your name, address, social security number, bank account number, credit card number, utility account number, basically any document that has any personal information about you on it. 4. Limit the number of credit cards you have and carefully check your statement each month. 5. Don’t give your personal information to any business unless you have to do so. The only businesses that NEED your social security number are banks, financial institutions, lenders, and prospective employers. Make your passwords strong by using my NULS system that nulls the efforts of hackers to try to guess your passwords or use a bot hacker to get into your accounts and your files. N-U-L-S stands for Number, Upper-case letter, Lower-case letter and Symbol. Include at least one of each of these in your passwords and it will make them harder to guess.